Phil Sidey (HoB) & John Wood (press officer). Copyright resides with the original holder. As the Head of the BBC Network Production Centre at Birmingham, Phil Sidey was the man who converted Pebble Mill from a structural white elephant into a thriving source of daytime television. He was the first manager of Radio Leeds and played a leading role in establishing lively local broadcasting on a financial shoestring. He was a programme innovator with a spate of lively ideas and an abrasive tongue which tended to upset some of his colleagues. He was also an accomplished public speaker and a successful chairman of the Royal Television Society. Sidey’s first experience of broadcasting was in Austria immediately after the Second World War. As a sergeant in the Royal Artillery he was in charge of the Army Broadcasting Station at Klagenfurt for three years. He then had a variety of journalistic posts including three years with the Associated Press before joining the BBC’s External News Service as a sub-editor in 1956. In 1963 he transferred to Television News, becoming a Duty Editor in 1964. In 1966 Harold Wilson’s Labour government decided to inaugurate eight experimental local radio stations. They were only to broadcast on VHF and their meagre annual revenue of pounds 50,000 for each station had to cover staff salaries and all programme expenses. That sum was not to be a charge on either the BBC Licence income or the rates. It had to be found from other local sources. In 1967 Sidey was selected to manage the new local radio station at Leeds. His application was a surprise, for many thought that he had abandoned radio for television, and he had no connections with the north of England. But he was ambitious to run his own operation and he feared he had made too many enemies in television news ever to reach its top position. Sidey had a great flair for publicity, including self-publicity. In order to get the name of the experimental station regularly mentioned in the local press, albeit only on the sports page, he bought a greyhound and named in Radio Leeds. 24 Hours, the television magazine of which Sidey had been the news producer before moving to Leeds, sent a camera team to make a sequence about the programmes he planned to introduce. One was a record request show called Bring-a-Disc in which, because his library was limited, listeners had to bring their own records to be played. Sidey was filmed outside the door of Radio Leeds urging passers-by to come in with their favourite discs. The film was shown on the day the station opened in June 1968. Sidey recruited a team of Yorkshire journalists to provide a valuable service of local news. The naïve idea of the Government that provincial newspapers would gladly provide the new experimental radio stations with copies of the local news they had gathered for their own us had soon evaporated. One of his innovations was The Only BBC Programme the Money Can Buy. Listeners would telephone the studio and demand a favour, promising in exchange to pay a sum of money to any charity of their choice. This worried the authorities in Broadcasting House, who feared it might upset the central scheme that ensured fairness among charity appeals. Another was Teenage Week, presented entirely by schoolchildren, which caused Sidey to be dubbed “Fagin” and accused of exploiting cheap child labour. In 1969 Sidey wrote a memorable article for the New Statesman, then influential with Harold Wilson’s government, on making community radio effective. Frank Gillard, the former managing director of BBC Radio, said that Sidey’s points convinced the entire Labour hierarchy of the success of the BBC’s local radio experiment. Sidey’s own lively, not to say outrageous, behaviour caused him trouble with the authorities at Broadcasting House on various occasions. After Radio Leeds he worked as the Deputy Editor of Nationwide until 1972, when he became Head of the Network Production Centre at Birmingham. The Pebble Mill complex, newly opened but planned some 10 years earlier and built at a cost of pound 8m, has a marble entrance hall with a vast glass foyer which is reached via a footbridge. But by the Seventies visitors mostly came by car and had to park at the back of the building. Sidey’s appointment coincided with the Government’s de-restriction of broadcasting hours and he seized the opportunity of putting Pebble Mill on the broadcasting map by offering to mount a live daily magazine from the idle space of the glass foyer. The London technicians had grave misgivings about the lighting and acoustics. But the difficulties were overcome, and Pebble Mill at One became the first important daily current affairs programme to be produced outside London for the BBC. Viewers were surprised to see elephants participating and studio guests arriving by parachute. Sidey insisted that every new programme originating in Birmingham should carry the name Pebble Mill in its title. As his successor, David Waine, put it, “He had a deep belief in the importance of regional broadcasting being independent of London and he pursued that belief with an acerbic and occasionally wounding wit.” It was Sidey’s defiant independence of London that led to his premature retirement in 1983. The Royal Television Society, founded in 1927, was originally a group of television enthusiasts intent on furthering this new scientific discovery. It consisted entirely of engineers. 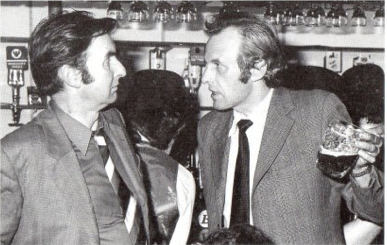 In 1978 Sidey was the first non-technician to be elected chairman. With the vigorous support of Sir Huw Weldon, who succeeded the Duke of Kent as President of the RTS in 1979, Sidey threw open the society’d doors to programme people and made it representative of the whole television industry. Phil Sidey was a trim, athletic man who loved walking along the Pennine Way. Hw was on a walking tour of the Peak District at the time of his death. Philip John Sidey, broadcaster: born London 11 January 1926; staff, BBC External Service News 1956-60, Teelvision News 1963-67; Station Manager, Radio Leeds 1967-70; Deputy Editor, Nationwide 1970-72; Head of Network Production Centre, Pebble Mill, Birmingham 1972-83; Chairman, Royal Television Society 1978-82; President, Birmingham Press Club 1979-81; author of Hello, Mrs Butterfield….1994; married 1951 Daphne Finn (two sons, one daughter): died Castleton, Derbyshire 15 October 1995. I worked at Pebble Mill from the opening date, and through much of the time that Phil Sidey was HNPC. Days when we had English Regions Drama in the same building. Television did Pebble Mill at One at the same time as a radio studio was doing Woman’s Hour, while CMCR9 covered sport, and The Music Desk was doing the Three Choirs’ Festival. I shared his view of regional broadcasting, and now wish I had told him so. He would have listened. Sadly the world has turned backwards in the demolition of Pebble Mill and its inferior replacement without so many departments. Phil was an innovator, and at the time Pebble Mill was just the right size so that everyone knew everyone else, if only by sight. One great thing about the regional centre was that different disciplines mixed together; the sound assistant doing a film shoot was the next day editing for radio. You sat with different people in the restaurant and exchanged ideas about the whole range of broadcast technology. One or two Presenters used to join me for coffee in the Comms Centre. It was magic for a while. Broadcasting needs more Phil Sideys and more Pebble Mills to represent and reflect life in the whole of the UK and especially the whole of England.